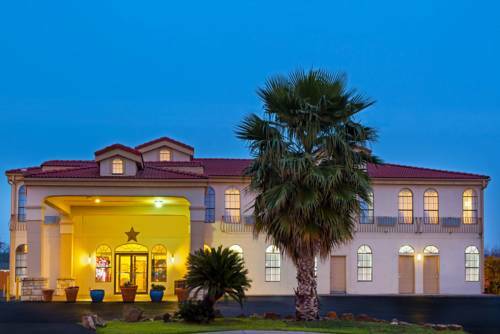 The San Antonio-Days Inn Northwest/Sea World offers you the best of Alamo City. The recently renovated Days Inn offers modern comforts and service, and deluxe rooms. All rooms come with FREE Expanded Continental Breakfast, FREE Hi-Speed Wireless Internet, FREE USA Today Paper, and FREE Local Calls. We also offer FREE access to Blast Fitness Center, located across the highway from the hotel. Guests can unwind by our sparkling outdoor pool after a long day. The hotel is minutes away from fine dining, a shopping center, and health club, and is close to Seaworld, Fiesta Texas with easy access to the NW 410 Loop. Nine miles from Lackland Air Force Base. This Days Inn prides itself on providing first class service and comfort to our guests. ~22 miles from San Antonio. ~40 miles from San Antonio. ~65 miles from San Antonio.